Keyboards might be the most boring things on our phones. For the majority of people, the keyboard that comes on your phone is the one you stay with. 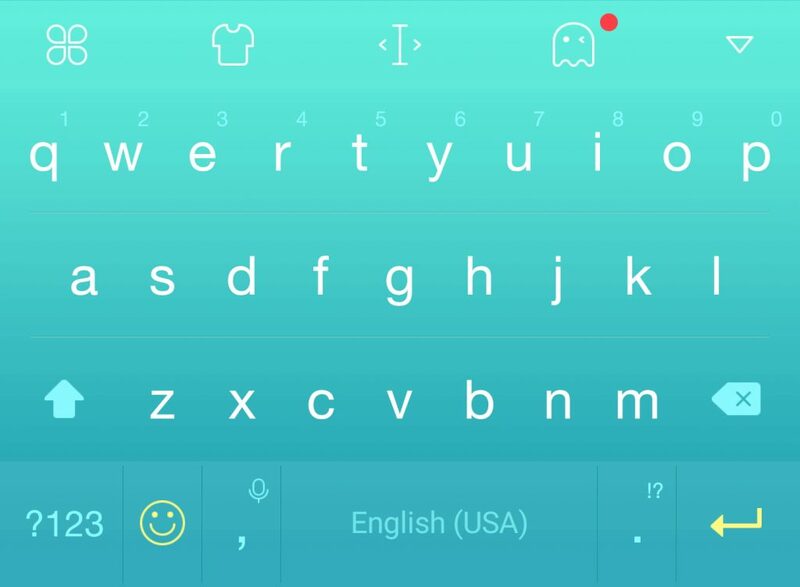 But there is a world of third party keyboard apps out there that do more than a stock keyboard app could ever dream. Today, we are taking a look at a keyboard that is trying to add some fun to your typing experience – Facemoji Keyboard. If you have ever used a third party keyboard before, the setup here is no different from that. However, for those of you just now moving away from your stock keyboard, the setup has a couple of extra steps. After downloading the app, you will have to enable it on your device and set it as your default keyboard. Thankfully, when you first open Facejomi Keyboard, it walks you through these steps in a way anyone can follow. After that is all done, you are ready to type. 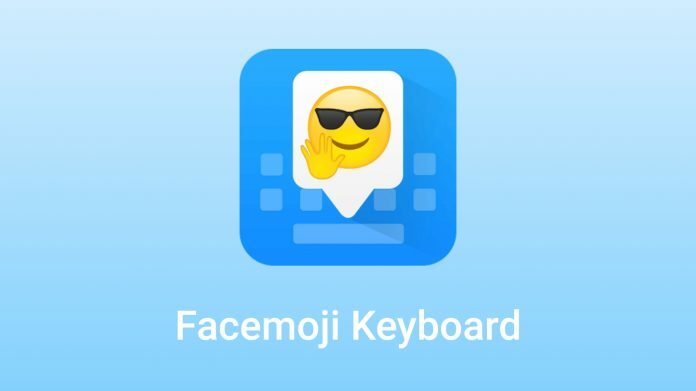 So what makes Facemoji Keyboard different from all the other keyboards out there? Over my week or so using the keyboard, I have to say that it is the most fun one I have ever used. 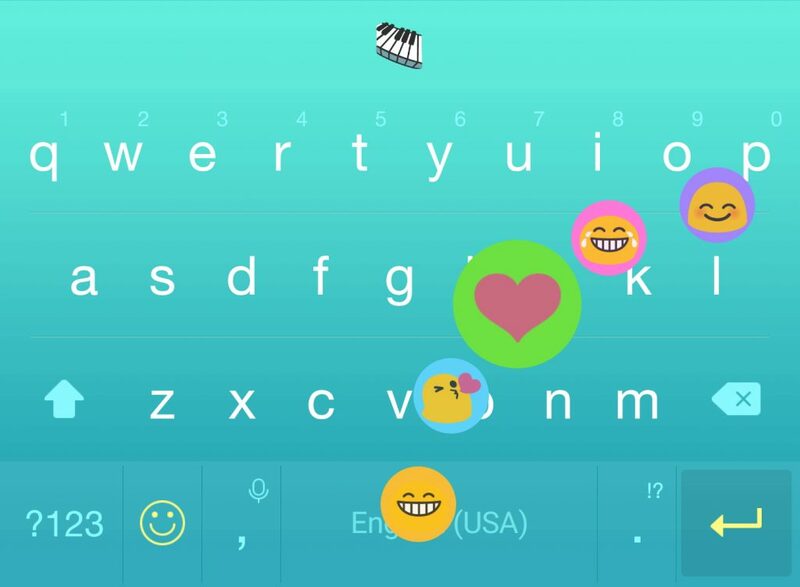 The first thing you will notice is the emphasis on personalization within the keyboard through keyboard themes and emoji styles. There are the normal keyboard themes like dark, light, and colors, but that is only the tip of the iceberg. Just scrolling through the library of themes for a few minutes, I came across ones about baseball, flowers, tattoos, and Paris. Some of the themes are even animated to add to their uniqueness, but I don’t know how friendly that will be to your battery life. I personally stuck with a normal blue color, but the option is there to pick anything you want. The default emoji style is iOS-like, but it can be changed to several different styles. I went back to the standard Android emojis as I am one of the few that seems to actually like the way they look. After spending some time making the keyboard look just the way you want, you can finally get into the typing experience itself. At the top of the keyboard, you will notice several hotkeys. The left-most one that resembles a four-leafed clover will show you different settings options. The shirt icon will let you choose a theme to apply from any of the default themes or those you have downloaded. You can also quickly access the theme gallery to find a new one. The cursor icon in the middle lets you precisely move the cursor around to place it exactly where you want. While I appreciate this addition and love how useful it is, I wonder why it was not done in a similar fashion to Google Keyboard where you long-press the spacebar and drag to position the cursor. This way would have freed up a spot in the top bar for another hotkey, but at least the feature was included in the app. The ghost emoji will take you to the sticker page, which we will talk about soon. Finally, the downward arrow on the right will minimize the keyboard. I think this is another wasted button as the back key on Android phones will minimize the keyboard already. I would have rather seen another shortcut in place of the arrow. The inclusion of stickers and GIFs is what set this keyboard apart from many others that I have used. For those of you who do not know what stickers are in a keyboard app, they are basically advanced emojis that are more detailed and sometimes animated. I personally have never used stickers or GIFs when texting anyone, but the features were integrated so well into Facemoji Keyboard that I decided to give them a try. The included sticker pack is iOS-style emojis that have been animated, but you can search through the sticker gallery and download any pack that you find interesting. 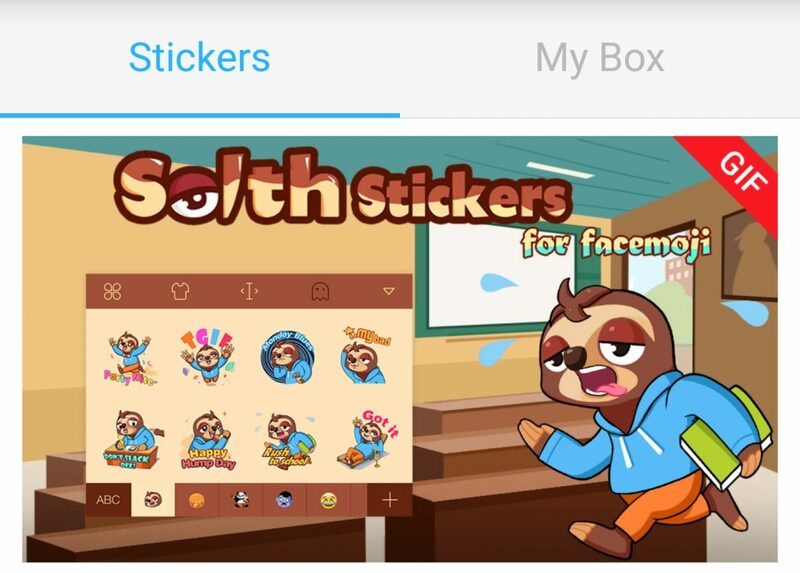 I personally like the sloth pack, but your options are numerous. When you switch to the emoji tab, you will find the option to use GIFs. You can choose from trending GIFs, select a tag to view related GIFs, or just use the search function. Earlier, I mentioned that Facemoji keyboard was the most fun keyboard I have used, and that is thanks in full to the inclusion of GIFs. Being able to quickly search up a GIF and drop it into a conversation is great, and although I know the same feature is available in other keyboard apps, I still thoroughly enjoyed it when using Facemoji Keyboard. My only problem was how Textra handled selecting a GIF from the keyboard. Instead of just sending it directly in the conversation I was in, a window would pop up and have me select who I wanted to send the GIF to. I did not experience this problem with other texting apps. There are a few time-saving features that Facemoji Keyboard also offers. Emoji prediction is exactly like preditive text but for emojis. Suggested emojis are displayed in the bar at the top of the keyboard, and you can tap directly on them to avoid having to swipe through multiple tabs of emojis. Holding down on the Enter/Return key will bring up your five most used emojis, which definitely saves time for those of us who use emojis constantly. The overall typing experience with Facemoji keyboard is about average, and I still cannot match the speed I get with Google Keyboard. The inclusion of swiping to type is wonderful, but I found myself typing at the speed I get with most other keyboards. There were a couple of problems I encountered while using this keyboard, too. If a word was autocorrected to another word after I pressed the space bar, I could not simply backspace and be given a list of words in the top bar (like I do in Google Keyboard). This meant I would have to retype any word that was wrongly autocorrected. Also, when backspacing to add on to the previous word, the keyboard would sometimes randomly scramble the letters of the word I wanted to add on to. Finally, the keyboard would often overlap popups or boxes that were not covered up by other apps. Most notably, anytime I wanted to add a word to my dictionary, the button to press in the popup was covered by the keyboard. Thankfully, I believe all of these problems can be fixed through a software update. I have enjoyed using Facemoji Keyboard over the past week, and I would recommend it to anyone looking to add some personal flair to their typing experience. As for me, I will be switching back to Google Keyboard for the typing speed improvements alone, but I will definitely miss the ease of sending GIFs with Facemoji Keyboard. 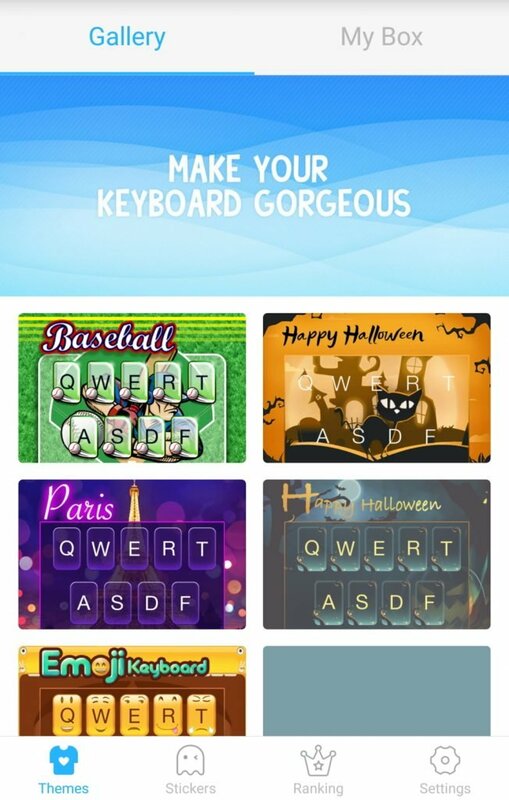 For those of you looking to try this keyboard out, you can grab it for free from the Play Store.